“See Through Other Eyes: Spotted Owl” is the friendliest stone sculpture! 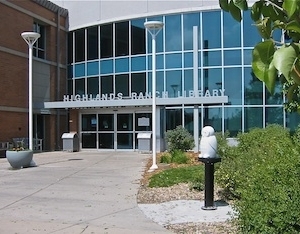 The Owl was taken down from his perch at Highlands Ranch Public Library on May 2, 2013. Many parents and kids going to and coming from the library stopped by to say good-bye. The many hand and chin smudges attest to how much they enjoyed him! Library Branch Manager, Sheila Kerber, sent me the lovely note reprinted below. We so enjoyed your owl this past year. It was not only beautiful but invited a lot of play. Rarely did a patron just walk by your art piece. They were drawn to get behind it and look through the owl’s eyes at the world. For many it became a library ritual to stop and lift their children up to look. You are a gifted artist and we feel very lucky that our library patrons were able to enjoy your piece this year.